Our full sized candy bar bouquet arrangements are such a hit! They deliver a sweet variety of favorite full size candy bars, chocolates and cookies. Add beautiful silk flower picks and butterfly decorations to create the best gift for her on any occasion. If you are looking to send a sweet surprise as a congratulations, housewarming, anniversary or a thoughtful gift for a co-worker or employee, this one is the ticket. What woman doesn't LOVE candy, chocolates and flowers. 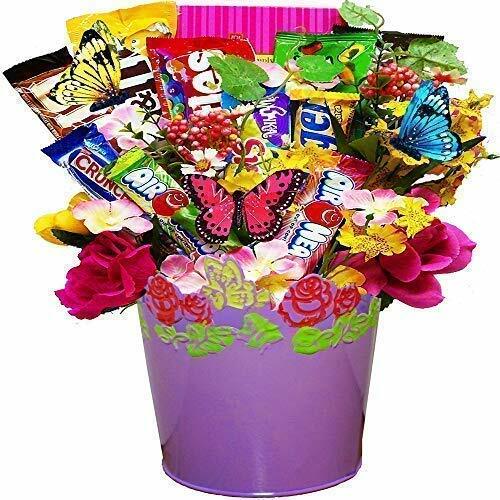 This Candy Bouquet is presented in either a green, orange, purple or yellow floral butterfly tin planter. Chocolate Dipped Cookies, Qty 2 Assorted Flavor Airhead Candies, Butterfinger Candy Bar, Licorice Red Vines, M & M Chocolate Candy Plain, M & M Chocolate Candy Peanut, Reese's Pieces Peanut Butter Candy, Original Red Skittles, Fruit Flavor, Big Hunk Candy Bar, Multi Color Silk Flower Picks, Butterfly Decorative Accents, Butterfly and Flower Decorated Tin. Include a free gift message with your order by selecting "Gift" during check out. Each package is hand crafted with care, shrink wrapped and tied with a ribbon bow. Boxed, ready for shipping and delivery to their home. Take the stress out of gift giving with this custom-made to order chocolate candy bouquet. Versatile for any occasion and loaded with the best selling fun sized candies from Hershey, Mars & Nestle. Our chocolate is stored at 60 to 70 degree's Fahrenheit and is never frozen to ensure quality and freshness. We take great pride in ensuring that your recipient receives a memorable gift and not a melted chocolate mess. Therefore, in the summer months, this bouquet ships with a re-usable gel pack, shrink-wrapped with a bow for a worry free gift giving experience. This M&M Chocolate Candy Bouquet is a decorative and delicious edible arrangement! It's also made entirely with M&M's! They range from peanut to original to caramel to peanut butter. So why not try them all? 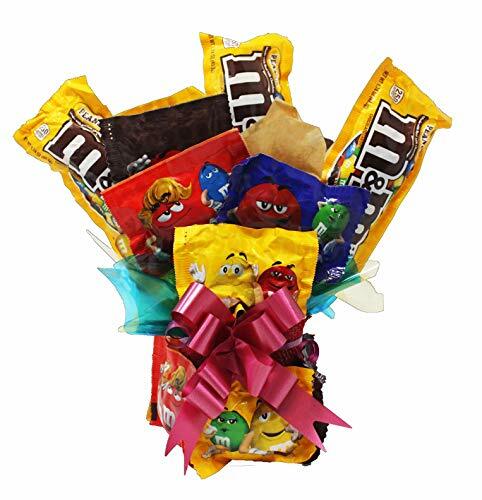 Send the M&M lover in your life the gift of cheer and brighten their day with this candy bouquet. The bright variety of M&M's makes it great for birthdays as well as get well presents. However you can also say you're sorry with "Many and Many" apologies. We'll ship it right to their doorstep shrink wrapped with a bow and gift tag for your convenience. You will certainly receive "Many and Many" Kudos for this gift! 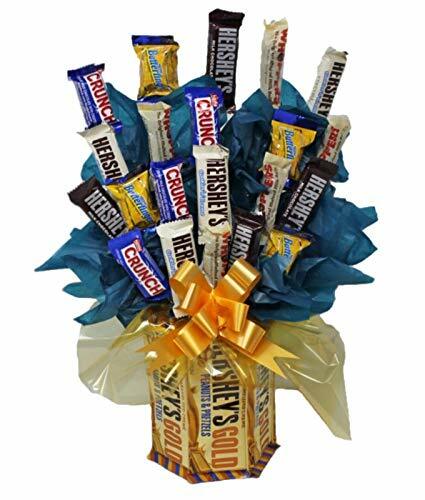 Edible Arrangement Chocolate Bouquet | Hershey Gold | Fun Sized Candy Assortment | Appreciation | Birthday | Get Well Soon Gift Our Chocolate Bouquet features 6 full sized Hershey's Gold candy bars arranged around a foam block to serve as the vase. The Hershey's gold candy bar is the first new bar introduced by the Hershey Corporation since they debuted the Cookies n Creme variety in 1995. Not only does this decadent bar boasts the harmonized flavors of caramelized creme with peanuts and pretzels, it's where sweet meets salty, and creamy meets crunchy. Equally important to the chocolate bouquet are the 20 fun-sized name brand candy bars: Nestle Crunch Bar Butterfingers Candy Bar Hershey's Cookies and Creme Whoppers In addition to the blue and gold tissue paper, there is a gold bow tied around the top of the Hershey gold bar vase, and the entire gift is shrink wrapped and ready to be delivered. Customize a gift tag and make it appropriate for any and all occasions. All our chocolate bouquets are made to order to ensure quality and freshness. Features: Fast Delivery right to your recipients door. Gold and blue themed 6 full sized Hershey Gold bars and 20 fun sized chocolate candy bars Stands 16" tall Add a personal message to the custom gift tag so they know who it is from. Send your bright & cheerful get well wishes with this clever get well soon gift basket delivered right to their doorstep. Whatever the ailment, we know this candy bouquet will bring relief along with a great big smile. Send your get well wishes with the best of good taste! Delicious and Fun Gift! 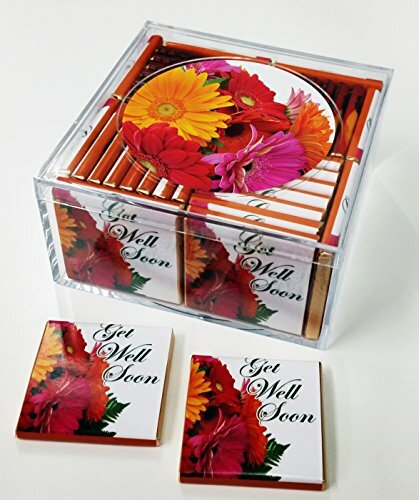 This colorful chocolate candy bouquet in a Bandaid Get Well Soon themed box makes an excellent gift and is filled with delicious pieces of fun size and bite size candy bars. Fun Size candies include multiple pieces including 3 Musketeers, Almond Joys, Butterfingers, Snickers, Baby Ruths, M&Ms, Nestle Crunchs, Mounds, Milky Ways, 100 Grands, Twixs and Kit Kats candy bars. We may substitute comparable candies if necessary. 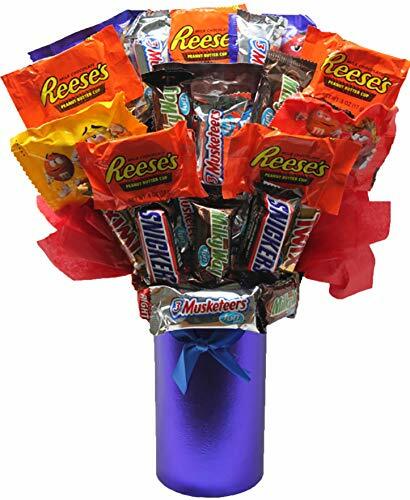 Candy Bouquet measures approximately 14in tall by 10in wide by 4in deep. M&M's Coffee Nut is the Winning M&M Special Peanut Flavor! M&M's Coffee Nut Peanut Chocolate Candy are made with coffee flavored roasted peanuts that have the same delightful and expected peanut crunch of regular Peanut M&M's. They are and are just as nutty and tasty. The roasted, coffee flavored peanut is still coated in real milk chocolate and surrounded by a colored candy shell. 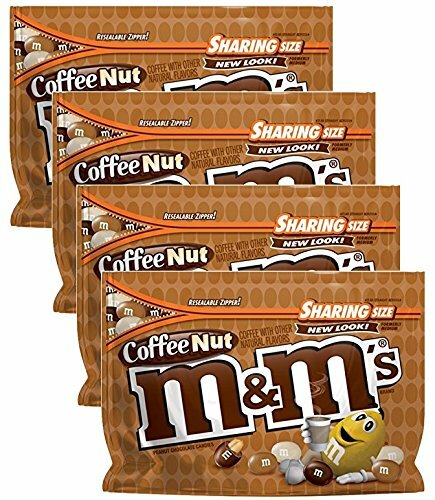 Extend your morning coffee pleasure and grab a bag of Coffee Nut M&M'S Peanut Chocolate Candies to share with family, friends, coworkers or to have on hand for chocolate emergencies. Fill up your candy dish, use them for baking, or bring them to your next office party. The fun ideas are endless with Coffee Nut Peanut M&M'S Candies. 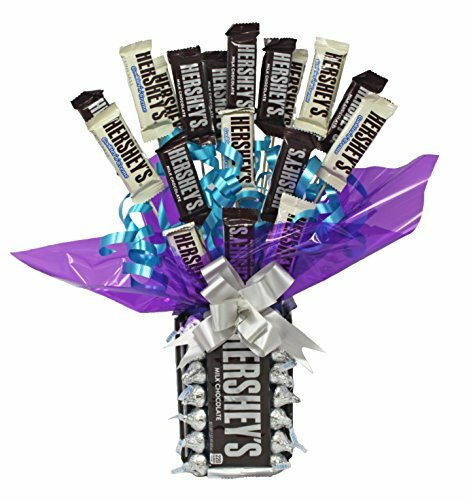 Let someone know you love them a "choc-a-lot" with this Hershey chocolate candy bouquet. The Hershey Company, and commonly called Hershey's is an American company and one of the largest chocolate manufacturers in the world! Soft, sweet, and consistent with a variety of fun-sized, full sized, and kisses sized chocolates, they'll get to experience the best that Hershey's has to offer. 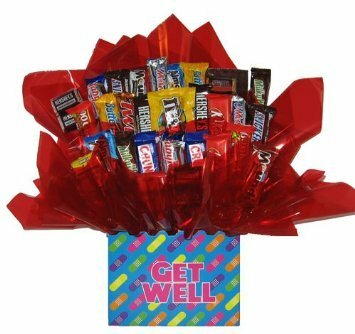 Want more Well Soon Candy Bouquet similar ideas? Try to explore these searches: Leisure Accents, Mount Frame Spider, and Speed Wrench Set.